First Line: They called the world beyond the walls of the Pod "the Death Shop." 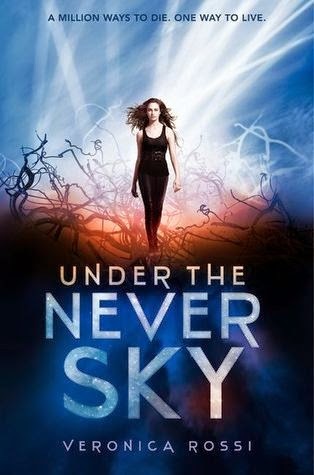 Review: I've had Under The Never Sky sitting on my shelf for maybe a year...or so. I bought it but then kind of got tired of Dystopians and forgot about the book and trust me I regret it. I found the concept of living in a virtual world through an eye piece pretty damn interesting although I would never want that personally. Anyways that is the world in which Ari lives in until things get screwed up and she is kicked out into the real world and left to die which is exactly what she expected would happen but didn't realize that there is more to the outside then what she was led to believe. The way the book started I was sucked right in but then, I don't know things became a little slow for awhile, I still stuck with it and then a few chapters after the fact things picked right up and I couldn't put it down. I also really loved the world building and I liked how the outsiders, not all but some had special abilities. Also I loved the main characters because even with everything that they were going through and even after falling for each other at the end they still cared about accomplishing what they set out to do from the very beginning. Overall I really liked it and I already have the second book which I will be diving into very soon. ~"If there was no fear, how could there be comfort? Or courage?"